One of my most treasured possessions was given to me many years ago as a confirmation gift. 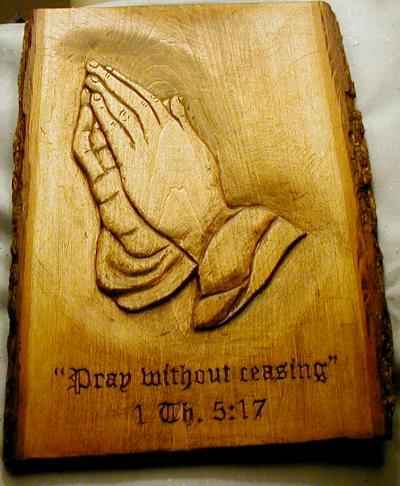 It’s a wooden hand carving of the Praying Hands. Those praying hands not only remind of the carpenter of Nazareth’s praying hands but also the following story of “The Praying Hands” from an unknown author. In 1490 two young friends, Albrecht Durer and Franz Knigstein, were struggling young artists. Since both were poor, they worked to support themselves while they studied art. Work took so much of their time and advancement was slow in coming. Finally, they reached an agreement that they would draw lots; one would work to support them while the other would study art. Albrecht won and began to study while Franz worked at hard labor to support them. They agreed that when Albrecht was successful he would support Franz while he studied art. Albrecht went off to the cities of Europe to study. As the world now knows, he had not only talent but was a genius as well. When he had attained success, he went back to keep his promise with his friend, Franz. But Albrecht soon discovered the enormous price that his friend had paid. For as Franz worked hard at manual labor to support his friend, his fingers had become stiff and twisted. His slender, sensitive hands had been ruined for life. He could no longer execute the delicate brush strokes necessary to produce a fine painting. Though his artistic dreams could never be realized, he was not embittered but rather rejoiced in his friend’s success. One day Albrecht Durer came upon Franz unexpectedly and found him keeling with his gnarled hands intertwined in prayer, quietly praying for the success of his friend, although he himself could no longer be an artist. Albrecht Durer, the great genius, hurriedly sketched the folded hands of his faithful friend and later completed a truly great masterpiece known as “The Praying Hands”. Today art galleries everywhere feature Albrecht Durer’s works. But as inspiring as this story of love and sacrifice is, there is an even more inspiring and amazing story of sacrifice that will be remembered and rejoiced over through the corridors of eternity. About two thousand years ago, after partaking of “The Last Supper” with His disciples (Luke 22:7-23), Jesus led them one last time into the Garden of Gethsemane (the place of the olive press). He asked them to remain with him and pray. He went a little further and prayed. He began to be in agony as He prayed. Luke, the physician, tells us that He prayed more earnestly and that “His sweat was as it were great drops of blood falling down to the ground” (Luke 22:44). Those hands of the carpenter of Nazareth, the creator of the universe, would soon be nailed to an old rugged cross for the sins of the world. But the battle for the souls of mankind was really won in the garden of prayer. In Gethsemane Jesus was pressed beyond measure. Three times He prayed that, if possible, the Heavenly Father would take the cup of suffering from Him. “O, my Father, if it be possible, let this cup pass from me; nevertheless not as I will, but as thou wilt” (Matthew 26: 36-46). What was that cup that Christ agonized in prayer over? It was the “He who knew no sin”, the spotless, sinless, Son of God would lay down His life as a sin offering for the world. (See Isaiah 53). In prayer He surrendered to the Father’s will, plan, and purpose. What amazing love! Have you lifted your hands in prayer? The greatest prayer that we can pray is “God be merciful to me a sinner” (Luke 18:13). The next greatest prayer that we can pray is “Father, not my will be done but your will be done in my life” (Matthew 26:39). In the garden Jesus told His disciples to “Watch and pray that you enter not into temptation; the spirit is willing, but the flesh is weak” (Matthew 26:41). Only with bended knees and praying hands and heart will you have power over temptation and the tempter. Jesus arose victorious over death, hell, and the grave. Those nailed scarred hands are still folded in prayer for you and me. “Wherefore he is able also to save them to the uttermost that come unto God by him, seeing he ever liveth to make intercession for them” (Hebrews 7:25). I urge you, come in prayer to Christ today. “Neither is there salvation in any other, for there is no other name under heaven given among men, whereby we must be saved” (Acts 4:12). Follow Him in the school of prayer.